We invite you to share in a special evening with Collective Arts Brewmaster Ryan Morrow at beerbistro. Join us to find out what it's like to work at Ontario's fastest growing brewery, and how his team creates unique beers week after week. Hear him recount stories of creating trendsetting products and what it's like to have 50,000 square feet of brewing space to play with. Our Executive Chef Nathan Campbell and our Bar Manager Raymond Bramberg have been working closely with Ryan to create a five-course tasting menu that perfectly complements the beers that Collective Arts has created. Tickets are available at the restaurant, over the phone or on Eventbrite (see below for link). 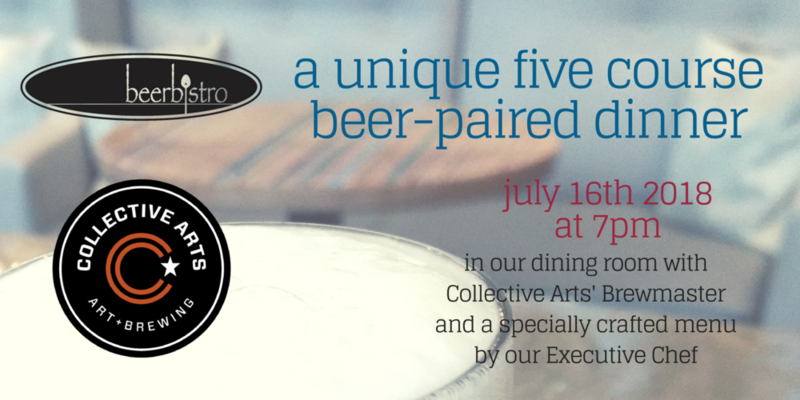 Ticket Price includes 5 course meal + 5 beer pairings led by Collective Arts Brewmaster. Our food is hand-crafted in house, from fresh-baked bread to house-smoked bacon we take our food very seriously, as seriously as we take our beer.